In this place along the narrow canyon, the runoff from ten million rainstorms had cut an overhang. Converging down the steep rock wall of the canyon side, the water poured off a six-foot layer of harder sandstone. Splashing in the intermittent plunge pool below, it had cut back into the softer rock beneath. Seepage and freezing chiseled flakes away, forming a hollow that extended twenty feet in. By now, the main canyon channel had cut low enough the side flow never flooded the hollow anymore. It was a cool, safe, shady nook; inviting to the eye of any human travelling in this hot country. The first people to find the hollow were small and brown-eyed, the men without much beard. Their home was the whole canyon lands. They used the small cave as a temporary camp, on nights away from the canyon over the ridge to the north where there was a permanent seep and enough flat ground to grow a little corn. Or when hunting, or travelling out to the country to the south. They cut cattails for sleeping mats. Cattails grew in some of the potholes in the canyon bottom. The sprays of green tapelike leaves were crowded in those hollows. The patches were scarcely bigger than bathtubs. These plants were the only soft vegetation in all the country of prickly piñon, rough juniper, and spiny cactus. The people had an eye to security. The hard sandstone layer above dropped sheer, a bit too tall for anyone to climb. The only way down to the shelter was one spot where a fallen chunk of rock had made a stepping place. Below, the canyon narrowed to a slot. Nobody could climb up through there without being noticed. They built fires in the cave, and out on the sandstone slope to the side. At one point, someone made a metate, or grinding stone. The slab of sandstone they chose was patterned by bits of twig and tule, fossilized in the sand it had been eons before. These lumps gave the working surface better “tooth”. The people used it for grinding acorns from the scrub oaks in the canyon bottom, or corn they had brought. The stone was too heavy to carry, so they left it there from one camping time to the next. They had bows and arrows, with points of flint, obsidian and chert. They had hides for clothing and gear. All they needed for a travelling camp. Centuries later, a tall, dark-bearded, blue-eyed man found the stepping place down the sandstone shelf and came into the little cave. He rested there awhile from the hot afternoon. The breeze up the canyon was cool, and kept off the juniper gnats. 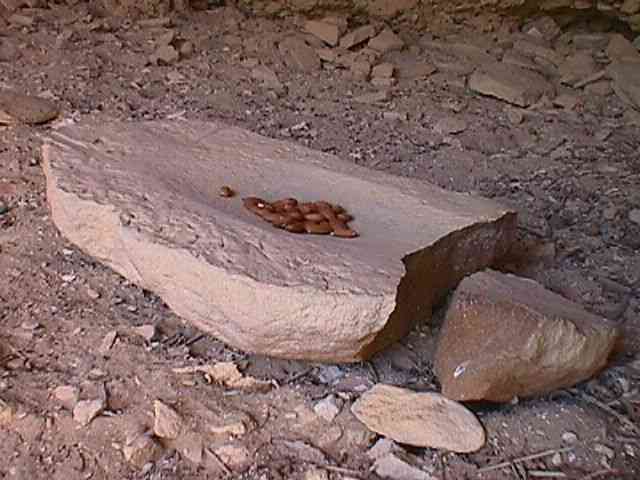 He put some almonds on the metate, for scale, and took a picture of it using a digital camera. All other sign of human use was utterly gone. All but a few flakes of sandstone which might have been stacked by hand to level the sleeping ledges, or might have fallen there on their own. And one reddened spot on the blonde sandstone marking the long forgotten glow of cookfires. Even the metate was broken, the end cracked off some time in the passing sweep of centuries. Categories: what's up | Tags: nature, outdoors, slice of life, travel | Permalink.